Eminem, who is gearing up to appear on Saturday Night Live tomorrow (Nov. 18) alongside host Chance the Rapper, has been making headlines all month, from building anticipation surrounding his forthcoming album to calling out Donald Trump during a now-viral freestyle at the BET Hip-Hop Awards. The rapper recently sat down with Shade 45 to discuss what he's been up to lately, such as his new collaboration with Beyoncé and the state of today's hip-hop. Additionally, during the conversation, Em spoke publicly on his fiery and unapologetic Trump-centered freestyle for the first time. During his a cappella-performance of his BET freestyle, the Detroit native absolutely tore into the 45th president and his supporters, spitting, "Any fan of mine who's a supporter of his / I'm drawing in the sand a line / you're either for or against / and if you can't decide who you like more and you're split on who you should stand beside / I'll do it for you with this: f—k you." Naturally, the internet collectively held its breath, waiting for Trump to respond on his infamously favorite medium of choice, Twitter. However, as it turns out, the president chose to stay silent, a phenomenon that Eminem admits had baffled him. "I feel like he's not paying attention to me," Eminem said, during the radio appearance. "I was kinda waiting for him to say something, and for some reason, he didn't say anything." Although he appears to be a bit disappointed or confused by Trump's lack of response, nothing has changed regarding his opinion of the president. "I was and am still extremely angry," Eminem adds. "I can't stand that motherf—ker." 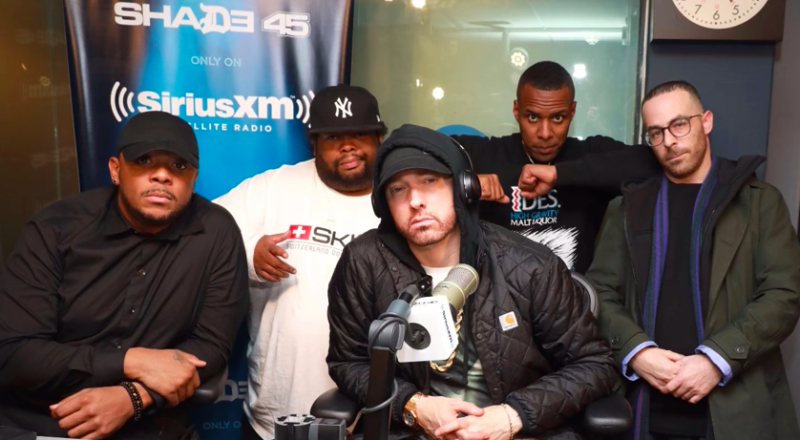 Take a look at some highlights from Eminem's recent sit-down on SiriusXM below.